This dog breed's name comes from the French word for cotton. The Coton De Tuléar has a long topcoat and covers its thin but slightly muscular body. Coton De Tuléars may be white or black and white. The Coton De Tuléar's coat is cottony and fluffy. The coat should not be cut, but should be brushed daily to remove dead hair. This breed only requires bathing once or twice a year to keep it clean. Coton de Tulears shed little and make a good breed for allergy sufferers. 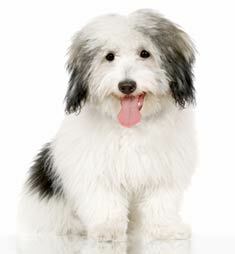 The Coton De Tuléar is a gentle and affectionate dog that loves pleasing its master. 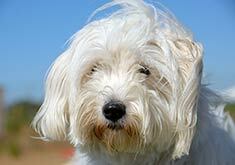 Coton de Tuléars get along well with children and other pets and become very attached to their homes. This breed has been known to jump or walk on its hind legs as a trick. The Coton De Tuléar can be expected to live about 14-16 years. Agile and energetic dogs, the Coton De Tuléar enjoys swimming and can follow its master on horseback for miles. The Coton De Tuléar is fairly active indoors and can do well without a yard. The Coton De Tuléar is in the companion group. Find Coton De Tuléar Puppies with our Free Breeder search!